A HOLIDAY photograph of his 10-year-old son in front of a window of skeletons in Cambodia sparked an online outrage that body language expert Allan Pease never could have predicted. Mr Pease, who lives at Buderim, has always taken his six children travelling with him on his lectures to audiences around the world. He believes in educating his children through real life experience, which is why he had no qualms taking his son Brandon and his nine-year-old grandson, Mitchell Stewart, with him to Cambodia's infamous killing fields. But when he put the photo up on Facebook, he copped some heavy criticism from a few concerned parents. "You want to show respect. 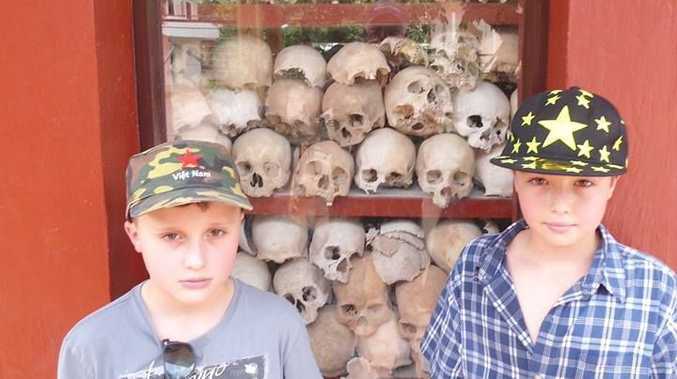 How about telling the shop owner to lay those skulls to rest and not parade in a window so dumb retarded foreigners like you can get photos with them," wrote Brendan Clack. "Would you like it if it was a relative of your's skull? You really think getting photos with them and posting on Facebook is educational! Ever heard of buying a book for them?" Most other people agreed that children needed to be exposed to the atrocities of the past to ensure they were not repeated. "Absolutely agree," wrote Tony Gioffri. "If we hide history (facts and not the writings of the winners) then we doom our future generations to repeating it and lose the value of the lessons learnt in the past." Mr Pease said he explained to his family what they were going to see and checked it was okay before taking them there. It wasn't the first bit of painful history the children had been exposed to. "They have been to Auschwitz and Siberia a couple of times," Mr Pease said. "A different culture helps put things in perspective for them. "Brandon has been to 55 countries so far. "He has been in street markets in the Ukraine where he has been able to see AK47s and rockets. over and saw what happened firsthand. "A lot of parents cottonball their kids, but they need to know the rest of the world is not like Buderim or the Sunshine Coast." Mr Pease said he always took photos on his journeys. "Most fathers were supportive, but mothers were either for or very against. I had to delete some of the comments because they were getting abusive. "They were asking what sort of parent I was that I would expose my children to this kind of tough love. "They live the experience. We make them do a school project so they record where they went, what they saw, the topography and culture. "I explained to the boys about Pol Pot and how (the killings in Cambodia) happened. "But when they saw the skulls, the reality of it hits you in the face."